We’ve been a lot less than perfect over the years — maybe you can learn a bit from some of our ‘favorite’ mistakes. No one is perfect — and while landlords aren’t any worse than anyone else, our mistakes can certainly cost a lot more than most people’s. We’d like to share with you some of the tales of woe we’ve heard from landlords we’ve dealt with in the past (and some of our own mistakes along the way.) Read on for some painful — and hopefully some laughable — mistakes that you might be able to learn from. Buying a property that’s too far away: if you don’t want to lose an entire afternoon to a single false alarm, or worse, let a vacant rental needing some TLC to get a tenant sit because it’s so far away, be sure to buy properties within a 30 minute drive of your home. Leaping before looking: no matter how awesome a new rental property looks, screen it thoroughly and have an inspector look at it. Always get an inspection: Early on, we closed on a property without an inspection. Big mistake. The single floor joist that we thought just needed a little repair ended up turning into all the rotted floor joists needing to be replaced! Mistake narrowly avoided: we were looking at a house that had been converted into a duplex, and it needed serious repair. We offered $17k less than the asking price, because it needed a lot of work. We were grateful beyond belief when, after that seller turned us down, we found a slightly more expensive property that didn’t need much by way of repairs. Sure, we spent slightly more, but we actually got a better deal as we didn’t have to spend months and thousands before we could rent it — it was a lifesaver. Short version: learn to look for deals, negotiate well, and reduce your own workload! Oh, they’ll be there: Don’t ever just assume that a prospect will arrive on time for a showing. Have your applicant call 30 minutes ahead of time to confirm that they’ll be there — and, as mentioned, make sure your properties are all not more than 30 minutes’ drive away! Always double-check: Don’t ever take an applicant’s information as true without verifying it. You’d be absolutely amazed at how a perfectly pleasant, church-going family that has all the right aura will lie through their teeth to get a roof over their heads. Pay attention to details: Speaking of which, watch out for people that are dressed sloppily — they’ll be sloppy…but people who are overdressed are often hiding (or compensating for) something. Not everyone who is properly dressed is a great tenant, but few people who are improperly dressed will be great tenants either. Start with solid criteria: When we first started out, we took on any prospect that “seemed nice” — because that was about the only criterion we had. Today, we have a list of pretty strict standards, and our properties run much more smoothly. Don’t assume everyone is honorable: Similarly, early on, we believed that everyone was more or less like us — raised to understand that their name was their bond. 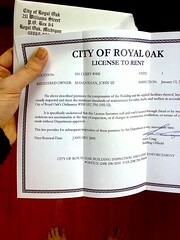 There are many tenants out there who think absolutely nothing about signing a lease they have no intention of keeping. Keep it professional-only: Finally, don’t rent to friends or family or anyone else who might expect to be able to violate the terms of the rental agreement (or might expect to rent without a rental agreement — another no-no). Such people inevitably feel like they should get more from you than your average resident, and are at the same time the people most likely to be slipshod with their payments. Next week, we’ll keep going and talk about some of the other mistakes landlords make. Until then, keep an even keel and focus on the long term! We are a 10yr family built – family owned 84 unit complex..until 4 months ago. We did start with anyone, to fill up. Of course over the first couple of years I learned how to “read” people. Running the place by myself, I trust I am now a pretty good judge of character. I have never had to evict a tenant..only 1 or 2, at the most will be late on their rent..we offer auto-debit, credit card, cash/check/money order. The tenants are only as good as the manager. I have a relationship with most tenants to where they can trust me..also knowing that fine line not to cross. We do not allow smoking or pets of any kind. We are a “crime-free” community and all of this is because I enforce the lease…without exception. I am a woman of my word..and the tenants know that if they bring an issue or maintenance problem to me..I will take care of it.